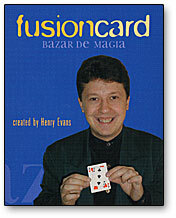 The magician shows the face of a card and places it face-down on the table as his "prediction." Then, from a miniature deck, a spectator picks a card and the magician states that he thinks both cards will be the same. But, when the miniature chosen card is shown it doesn't match. Nervously, the magician places the little card over the face of his prediction card, and asks a spectator to hold both of them between his hands. The magician removes a lighter and passes it under the spectator's hands. When they open their hands, the cards have magically fused together into one! The promise that the two cards would be "the same card" was fulfilled!